『삼국사기』는 고려 인종 23년(1145)경 김부식이 신라·고구려·백제 3국의 정치적인 흥망과 변천을 중심으로 편찬한 역사서이다. 인종의 명에 따라 김부식의 주도하에 11명이 참여하여 편찬되었다. 삼국사기(三國史記)가 만들어진 12세기 전반의 상황은 고려 건국 후 200여년이 흘렀고 문벌귀족문화가 절정기에 이르렀으며, 유교와 불교가 서로 어우러져 고려 왕조가 안정되어 있었다. 따라서 자기 역사의 확인 작업으로 전 시대의 역사정리가 필요하였다. 조정에서는 거란을 물리친 후 자신감에 차 있었고 여진의 위협에 대한 강렬한 국가의식이 고조되어 있었다. 또 한편 문벌귀족간의 갈등과 대립이 심각했는데, 분열과 갈등을 국가가 망할 수 있는 원인으로 강조함으로써 현실비판의 뜻과 역사의 교훈을 후세에 알리려 하였다. 삼국사기 권44∼50(三國史記 卷四十四∼五十)은 13세기 후기에 찍어낸 것으로 현존하고 있는『삼국사기』가운데 가장 오래된 것이다. 지금까지 알려진 것으로 완전한 것은『옥산서원본(玉山書院本)』과 이 책의 2질(帙) 뿐이다. 이 책을 통해 중종대 간본(刊本)의 잘못된 글자와 빠져 있는 글자를 바로 잡을 수 있게 되었다. 원판이 이미 닳아서 복구가 불가능한 곳이 있고, 글자가 잘못되어 있거나 빠져 있는 등의 결점이 있기는 하나 현재로선 가장 완전한 것이다. 이 책은 통일신라시대를 포함한 한국고대사를 연구함에 있어 일연의『삼국유사』와 더불어 최고의 사료적 가치를 지니고 있다고 평가된다. This great work of Korean history centered around the rise, progress and fall of the three ancient Korean kingdoms of Goguryeo, Baekje and Silla was published by Kim Bu-sik in 1145 (the 23rd year of the reign of King Injong of the Goryeo Dynasty). 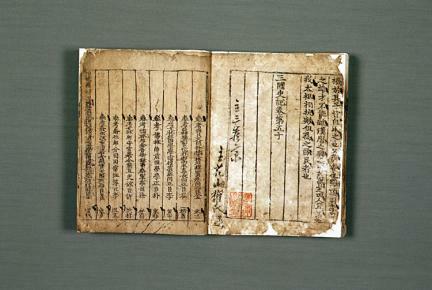 At the command of King Injong, Kim Bu-sik and eleven other persons undertook the production of this seminal work. By the early 12th century, when this book was published, about 200 years had passed since the foundation of Goryeo, and its aristocratic culture had attained the acme of prosperity, while the dynasty itself had been stabilized by a mix of Confucianism and Buddhism. As a result, a compilation of Korea’s preceding history was required in order to verify its own history. After defeating the Khitan tribes, the government acquired even greater faith in itself, and a stronger national consciousness emerged to counter the threat posed by the Yeojin (a Chinese tribe). However, as there were serious complications and antagonism between the nobility, this work was intended to inform future generations of the criticism of social reality and provide historical lessons by emphasizing the split and political complications and turmoil as the causes of the dynasty’s fall. 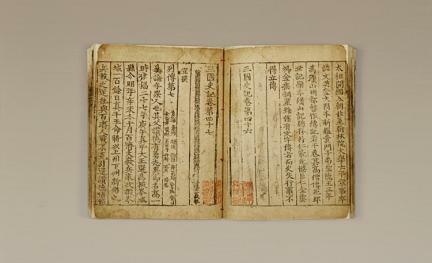 This book was printed at the end of 13th century and is the oldest extant version of Samguk sagi (History of the Three Kingdoms). It measures 19.5 cm by 25 cm, and is in poor condition. 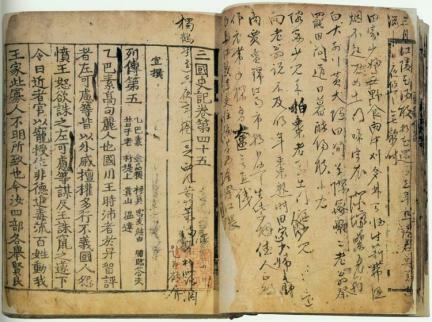 The most intact versions known to date are this book and that of the Oksanseowon Confucian Academy. This version served as the standard for the correction of erroneous words and missing characters in the King Jungjong version. The original version is missing certain parts that are now irrecoverable due to serious effacement and contains numerous defects including wrong words, missing characters, etc., but it nevertheless remains the most perfect copy currently in anyone’s possession. 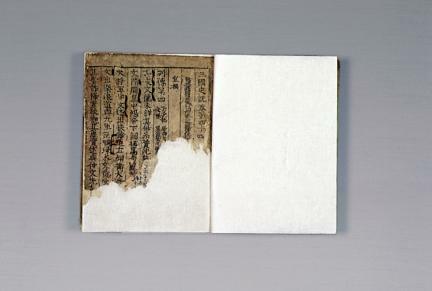 The book, along with the Samguk yusa written by Buddhist Monk Iryeon, has been evaluated as a work of the greatest historical value for research and studies on ancient Korean history, and more particularly the Unified Silla Period.